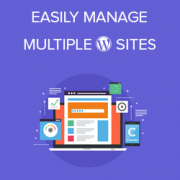 Are you looking for an easy way to manage multiple WordPress sites? Monitoring multiple websites and keeping them up to date can be very time consuming. 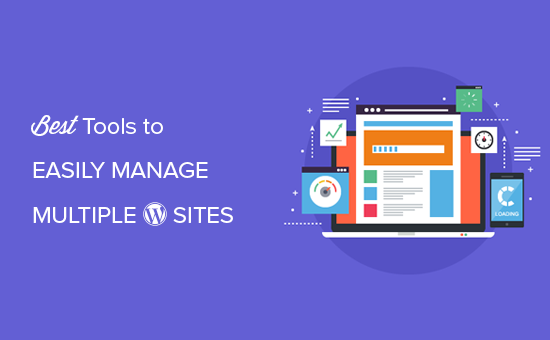 Luckily, there are several WordPress management tools that make it super easy to manage multiple WordPress websites from a single dashboard. This will help you save a lot of time while keeping all your WordPress installs and plugins up to date. In this article, we will share the best tools to help you easily manage multiple WordPress sites from one dashboard like a pro. Why Use a WordPress Management Tool to Maintain Multiple WordPress Sites? 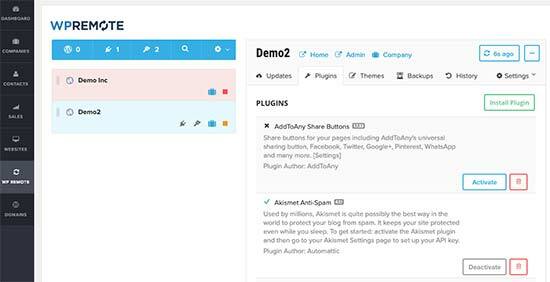 WordPress management tool makes it easy to manage multiple WordPress sites from a single dashboard. Managing your sites using a multi-site management tool helps you keep an eye on all your sites without logging into each site separately. Whether you are an individual user, freelancer, or an agency, using one of these tools can help you save time while making sure that all your sites are functioning properly. Providing website maintenance services to businesses is also a popular online business idea. 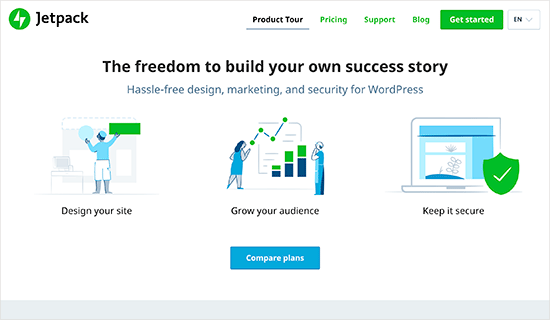 You can use these WordPress site management tools to help grow your freelance business. That being said, let’s take a look at the best tools to easily manage multiple WordPress sites from a single dashboard. InfiniteWP is a powerful WordPress site management tool optimized for agencies, developers, and freelancers. 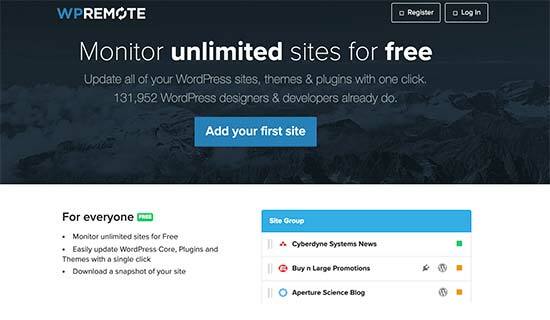 You can manage unlimited websites for free. However, the free version is limited to managing WordPress plugin, theme, and core updates. It also allows you to create on-demand site backups, but you’ll need a paid addon to store them on a remote storage location. The real power of InfiniteWP is unlocked with their premium plan which includes all paid features like: easy website deployment, staging website, migrations, malware scan, uptime monitoring, client reports, managing comments, publish posts and pages, 2 factor authentication, broken link checker, and more. They also let you white-label the plugin with your own branding, so your clients see your logo instead of InfiniteWP. InfiniteWP is not a SaaS application. Instead it allows you to install the WordPress management tool directly on your own site. You can install it via an installer plugin, via cPanel, or manually upload it to your server. Once setup, you can add websites that you want to manage and then install the InfiniteWP client plugin on those websites. This client plugin connects your websites to the InfiniteWP’s admin panel. This gives you infinite control over the sites you manage. Pricing: Free + paid plans starting from $147/year for 10 sites. 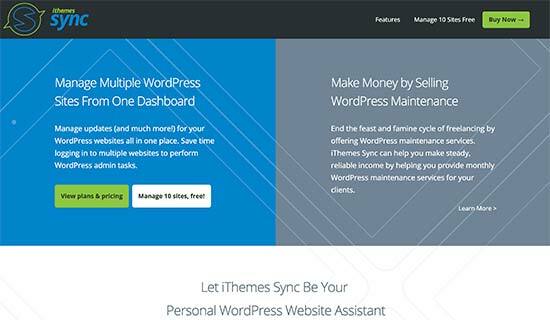 iThemes Sync is a powerful WordPress management tool brought to you by the folks behind the popular BackupBuddy plugin. It comes as a limited free version that you can use on 10 sites. 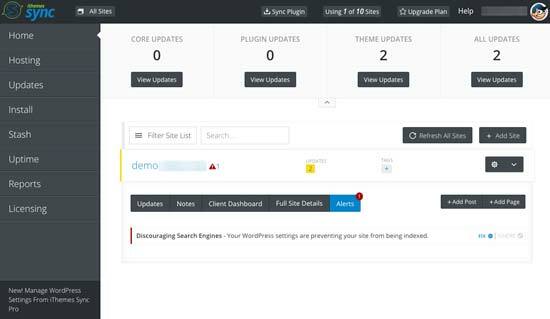 The free version allows you to manage WordPress updates from a single dashboard. You can also install themes and plugins from WordPress.org or by uploading them manually. The real power comes with the paid plans which give you access to uptime monitoring, client reports, user management, security, and integration with BackupBuddy cloud storage, Google Search console, and more. It comes with an easy to use intuitive interface which makes site management a breeze. Pricing: Paid plans start from $11 per month (billed annually) for 10 sites. Jetpack is a powerful plugin suite that comes with multiple WordPress site management features. You’ll need a WordPress.com account to start using Jetpack. (See the difference between WordPress.com vs WordPress.org). The free Jetpack plugin acts as a connector between your website and WordPress.com servers. You’ll be using the WordPress.com dashboard to manage all your WordPress sites. 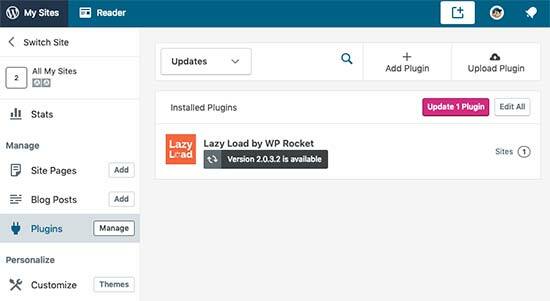 Using the free version you will be able to manage WordPress plugins and core updates across all your websites. It also comes with downtime monitoring and basic brute force attack protection. However, you will need to upgrade to their paid plans to get more features. There are plans with different features including automated backups with Jetpack, malware scanning, security fixes, site activity logs, and more. Pricing: Free + paid plans starting from $39/year. CMS Commander is a paid WordPress website management tool. 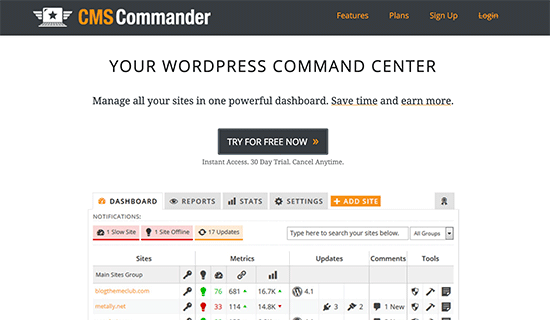 You’ll manage your websites from the CMS Commander dashboard. In order to connect all your websites, you’ll need to install a client plugin on each site. It includes all the usual features like 1-click updates, backup management, 2-factor authentication, basic malware scanner, custom branding, and more. What makes CMS Commander a little different than other tools on the list is its content management features. It allows you to utilize third-party sources like YouTube, Flickr, Yelp, and more to add content. It also connects with article spinning services to rewrite content and post it to your multiple websites. For affiliate marketers it offer integrations with popular affiliate networks like Amazon, ShareaSale, Commission Junction, and more. Pricing: Plans start from $8 per month for individual website owners. Business plans for agencies and large site networks start from $30 / month. 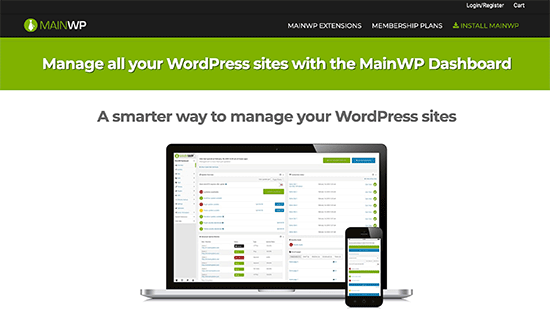 MainWP is a free WordPress website management tool supported by paid add-ons. It comes as an admin plugin that you install on a separate WordPress website. After that, you need to install the MainWP child plugin on all websites that you want to manage. 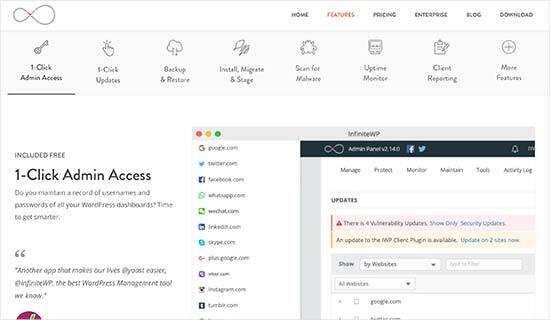 MainWP comes with easy update management, uptime monitoring, security scanner by Sucuri, vulnerable plugin and theme scanner, user and content management, and more. It also comes with extensions for several popular WordPress backup plugins including UpdraftPlus, allowing you to manage your backups as you want. You can also find extensions for bulk upload articles, client reports, access control, and more. Pricing: Core plugin is free with paid extensions for different features. 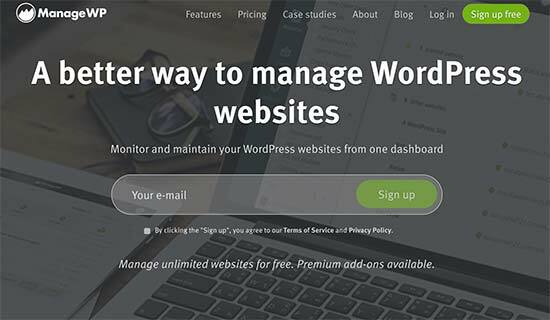 ManageWP is a free WordPress website management tool allowing you to manage all your WordPress sites from a single dashboard. The dashboard is hosted on ManageWP’s website, and you connect all your websites by installing the Worker plugin on each site. This plugin acts as a bridge between your websites and ManageWP dashboard. Using a single dashboard, you can install one click updates for all your WordPress plugins, themes, and core WordPress files. It also allows you to moderate comments on all your sites from the ManageWP dashboard. The core ManageWP functionality is free for unlimited sites. However, they also offers paid add-ons on a monthly subscription basis. It includes automated monthly backups and security scans for free but you will need the paid addons for real-time backups and automated scheduled security scans. Other notable features include performance analysis, uptime monitoring, SEO ranking, and historical logs of all activities performed by ManageWP on your sites. If you are an agency, then you’ll like their client reports, which you can send to your clients to keep them in the loop. ManageWP also offers white label service which entirely hides ManageWP branding and allows you to offer your clients a user experience with your own brand. Pricing: Free for unlimited sites with paid add-ons available on monthly subscription basis. WP Remote offers simple way to manage updates on all your WordPress sites. It is a basic WordPress management tool with a limited set of features than some other tools on this list. It allows you to easy install WordPress updates for core, plugins, and themes. You can also use it to create backups and download them to your computer or store them on AWS or SFTP. Pricing: Free for freelancers and individual website owners. Agency plans start from $20/month and allow you to add more users. Which One is The Best Way to Manage Multiple WordPress Sites? Choosing the best WordPress website management tool entirely depends on your needs. An individual user with fewer WordPress sites may want a solution that’s easier and cheaper. On the other hand, if you are a freelancer or agency working for clients, then you’ll want to use something more powerful and advanced. In terms of features, ease of use, and flexibility we found InfiniteWP to be the best WordPress management tool. It is a perfect fit for freelancers, agencies, and developers. If you only want to manage a few sites and don’t need all the advanced features that InfiniteWP offers, then we recommend iThemes Sync or Jetpack for basic website management. We hope this article helped you find the best tools to easily manage multiple WordPress sites. You may also want to see our ultimate WordPress security guide to make sure that all your sites are properly secure. i have used infinite wordpress in the past but not any other form this website menu. thanks for the blog. i am a beginner. i have used your coupon to purchase a site at SiteGround in the hope you will help me build the dream website, etc. and would like to get started? Thanks for the guide to maintain multiple WP sites and the tools mentioned. InfiniteWP is one of our secret weapons. It is an awesome tool! Thanks for this review of the various options for managing multiple websites. My only experience is with ManageWP, first as a standalone company, and now owned by GoDaddy. ManageWP is a resource I could not live without, since I handle dozens of sites. Migration and cloning is easy and invaluable. I’ve moved many websites from one host to another, and cloned them for test sites – so easy. The ManageWP crew have been helpful on the few occasions I’ve need support. Mostly it just works, and works well. Thanks for that useful article. You provided the information and also the solution. You did not mention Updraft Central which is a feature of Updraft Plus. You install it as a WordPress plugin and connect all your websites where you have Updraft Plus installed. Very strong, secure and user friendly, I can only recommend it!